P.S. I love both of your blogs! This is amazing! 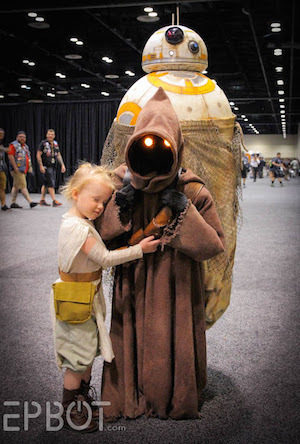 I'm halfway tempted to try making one for my little cousin! She just got her first wand in the mail the other day for her birthday. 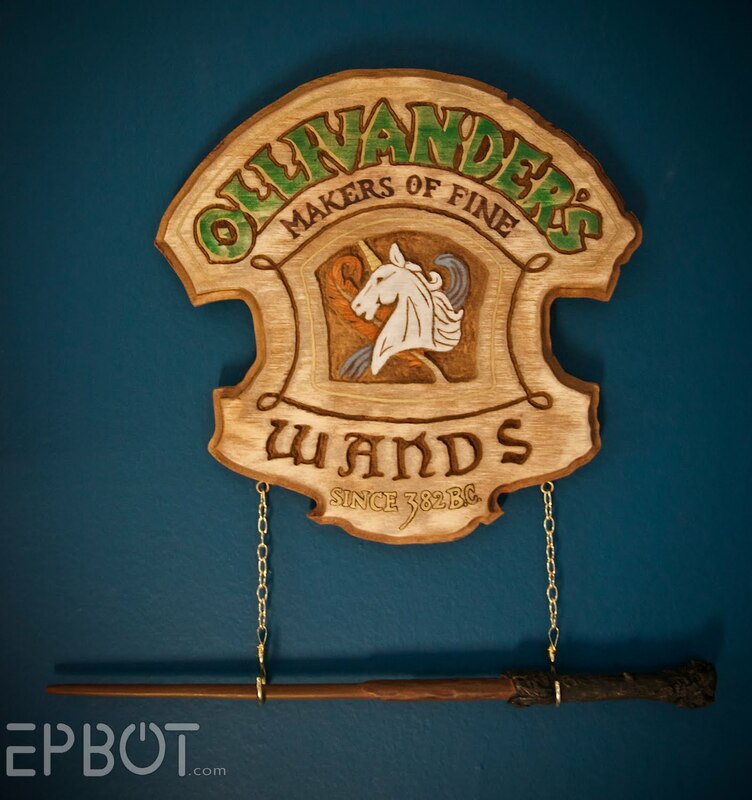 That wand holder is AWESOME. 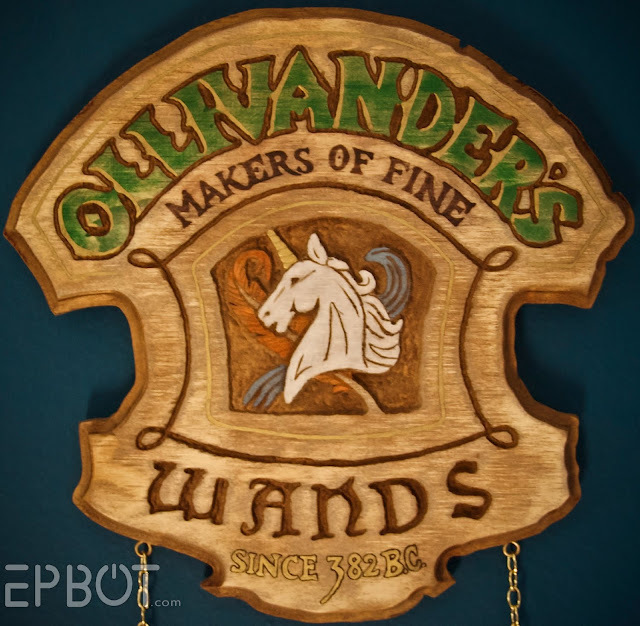 Now I want to buy a wand! When I went to Wizarding World, I held off because I thought, what will I DO with it? We haven't done anything that elaborate, but we've held a party each year before the movie, and there's always some kind of crafting involved. 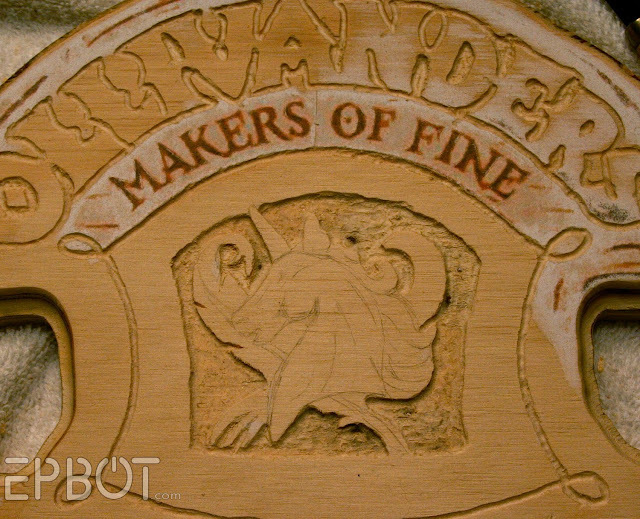 The only "good" one that's online is the galleon we made to send out to people before Order of the Phoenix: http://lottloft.blogspot.com/2007/07/dumbledores-army.html The hubby carved the galleon and then used Sculpey Mold Maker to make a mold for the front. Once we molded the fronts, we stamped the backs (with rubber stamps...they're...ummm...quite "unique" =) and baked 'em! that gold leaf is AMAZING!! I have got to get some. Wow, that is awesome! Plywood has never looked so good! I seriously need my own place so I can decorate and craft to my hearts content!! 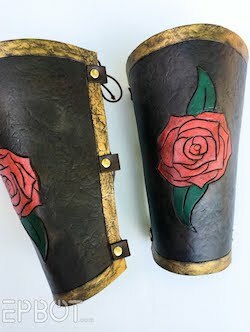 I stained it with watered down burnt umber acrylic paint (the lighter part) and a mixture of the acrylic and liquid black shoe polish (the darker handle). I have to admit, buying a HP wand is something that I always thought was pretty lame. Despite my love for most things Potter-ish, I couldn't see a way that a prop wand could be displayed without looking totally Riddikulus. I stand embarrassed like a boggart-Snape. Please make these, sell these and let me buy one from you. YES PLEASE. Please open a Etsy shop or something! Truly amazing. I really, really love that. If you want to source a handcrafted wand that just looks fantastic, check out this article from my local newspaper. I saw this kid at a local craft show and thought his work was magnificent! You ARE the MOST awesome wife in the world! That is an awesome work of art! Great job! FOR THE LOVE OF SHERBERT LEMON DROPS, THIS IS FAMAZING!! Are you and John taking commissions? I will pay you handsomely, in chocolate frogs if you wish. Loads of them. 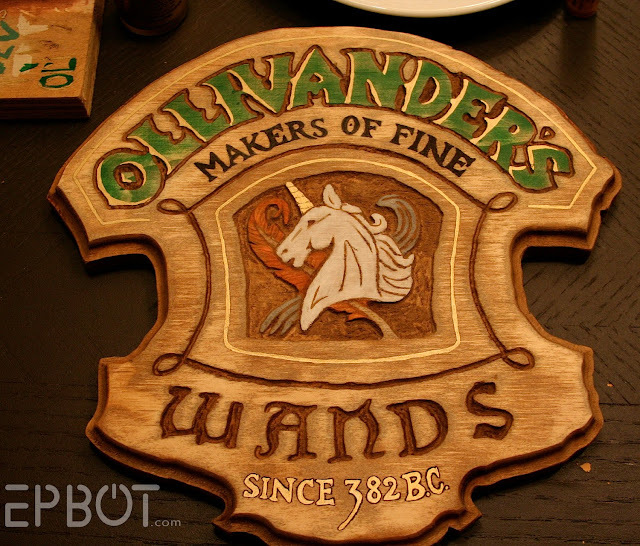 Also, I always thought it was, "Ollivanders," because it was a family business. 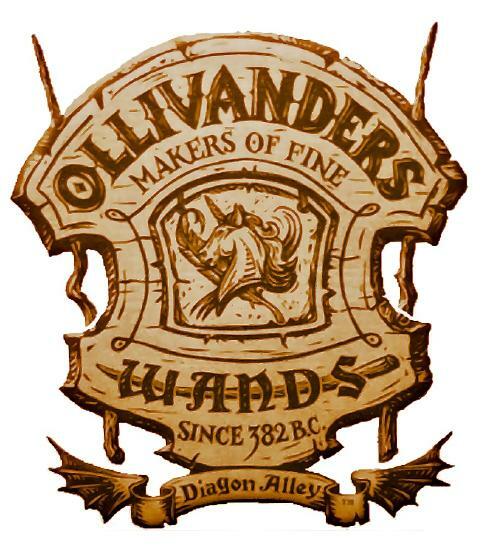 As in multiple Ollivanders: Makers of Wands. Awesome craft! I can't believe you guys actually made that by hand. It looks like one of the fancy things you can buy from the little pamphlets they insert into Potter DVDs. I love, love, LOVE this! I'm so jealous. A friend of mine visited The World of Harry Potter recently and brought back a really fancy wand for me. I wish I had something awesome like this to display it with! Do you take orders??? This is amazing...but I'm still getting over the fact that you're such a movie/sci-fi buff, but you don't do movie theaters. You must have a well-used DVD player! @Lulu - "embarrassed like a boggart-Snape." WV: "matiew" - Boy, that Matiew Lewis turned out all kinda hot. Who knew that Nevile had it him?" Glorious! I'm inspired. 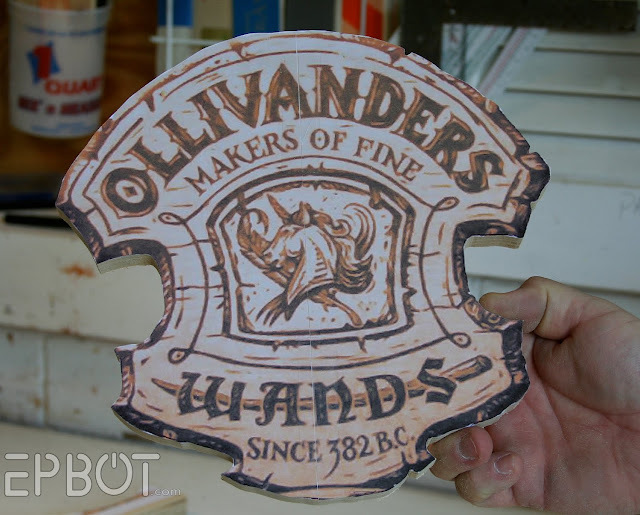 I'm making quite a few props for a HP Halloween bash this year, and now I'll have to add an Ollivander's sign to the list! You. Two. Are. Frakin'. AMAZING! I need this. Like truly and utterly need this Kline my life depended on it need it. I've had a wand for a while now. Just a cheap one that "chose me". Or well my brother bought for me for Christmas. But this past year hubby did an amazing thing and got me Ginny's wand! Favourite character of all time obviously sadly it's still just sitting in its box. So again I say I NEED this. I'm so jealous now it hurts. Just curious--what is the problem with movie theaters? And you can't say gum on the floors because that's part of the ambiance. This is amazing! We have LOTR mini swords, but no HP wands... this totally makes me want to get one! Beautiful work. Wish my hands were that steady with paint. Very Cool! I love that it looks weathered and It looks like a shop Display they would have in the wand shop itself. Well Done on another fabulous DIY job! You ARE the best wife ever. After seeing this I wish I was married to you. I would say "don't tell my husband" but since he too is an avid reader of Cakewrecks I'm sure he wouldn't oppose. i am speechless. i have no speech. once again, i am amazed. 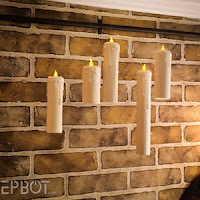 once i have my harry potter wall finished, i will send you some pictures. AWE.SOME! I'm amazed at your skill. 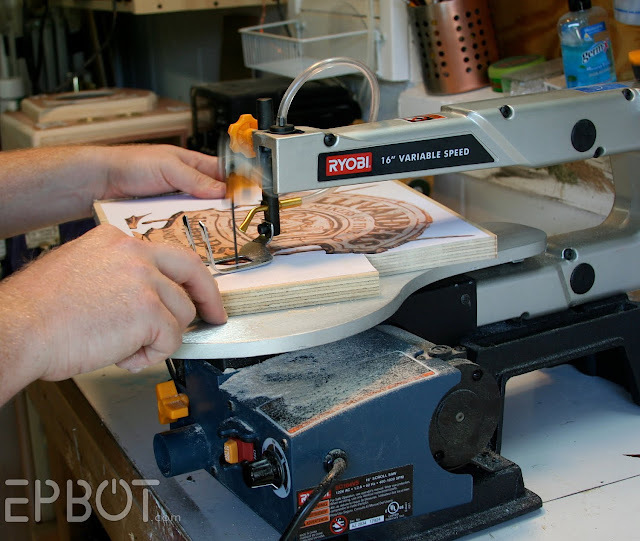 You've a wicked hand with the Dremmel Tool; great work! @ TechyDad - that's a gorgeous 'scope! 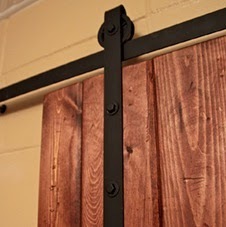 The best/easiest displays I've seen are simple wood "legs" with curved notches cut out, mounted to a wooden base. You lay the telescope on top, and the legs keep it elevated a few inches (or however high you make the legs.) That's probably what I would make in your place, and then set it on a bookshelf or table somewhere. @ Kate - You MADE that?? Amazing! Truly, truly amazing. 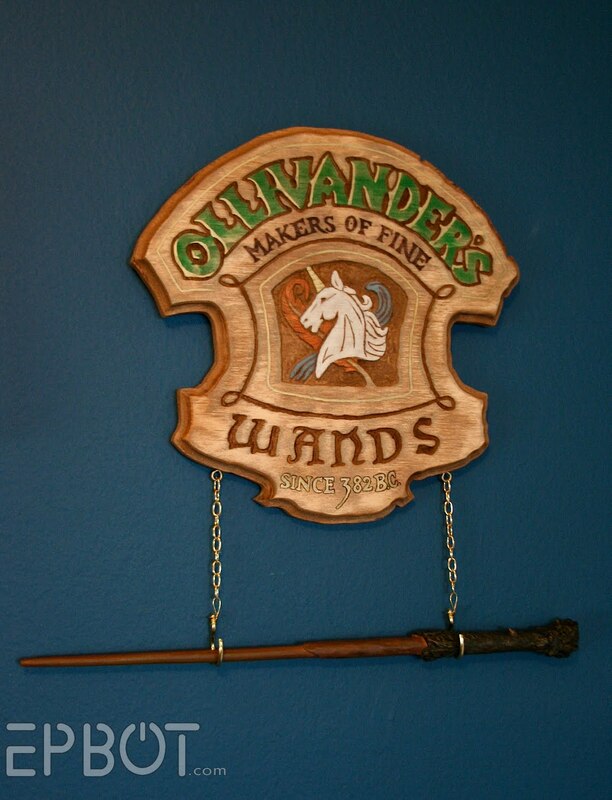 I'd have guessed you paid big bucks at a movie reproduction place for that wand. Just gorgeous! @ geeky Heather - I know this is a little late, but...I WANT TO GO TO ONE OF YOUR PARTIES. 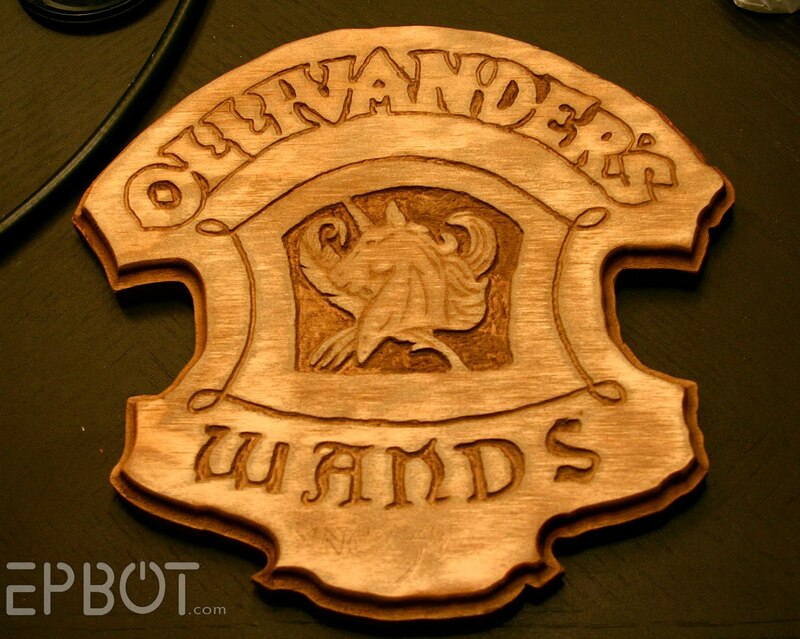 Since I have Harry's wand as well, how much will you charge me to make another one of these? ;) I'm just kidding you. I probably will steal your idea, only I doubt mine will be as elaborate. 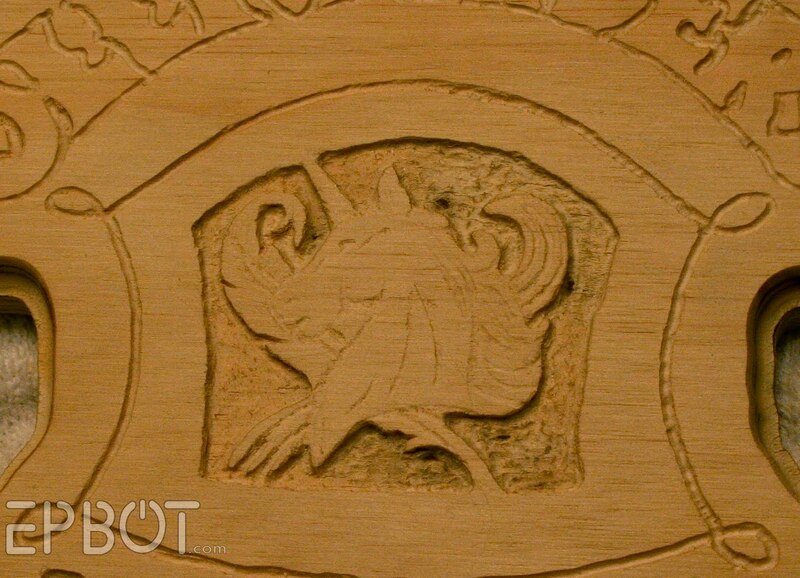 I am very, very impressed--I doubt very seriously my first crack at wood carving will be a horrible mess! But I really, really like how the wand came in a box that looks like the boxes from Ollivander's in the movie. I wore this shirt when I went to go see HP8: Ollivander's T-shirt And I cried my eyeballs out when it came to Snape. Even though I'd read the books, it was hard to watch and I got very emotional. Snape is my favorite character. These are the b-day present I'm doing for my hubby. I'm going to put them in a 3 window frame with Harry, Hermione and Ron in the middle, the "friends" on the top and the "foes" on the bottom. I chose a dark taupe colored Aida to do the work on. Ok, I know you've explained how you did it but I'm still in awe! This is absolutely amazing!!! I want one so much, you should sell them online...AMAZING! I wish I had your crafty talent. A friend of mine has a hand made wand that her husband made her and I would love for her to have something similar to display it in. He even made her a Harry Potter type box to put the wand in, complete with a small certificate of authenticity showing what the wand is made of and what material is at it's heart. It's just beauitful. 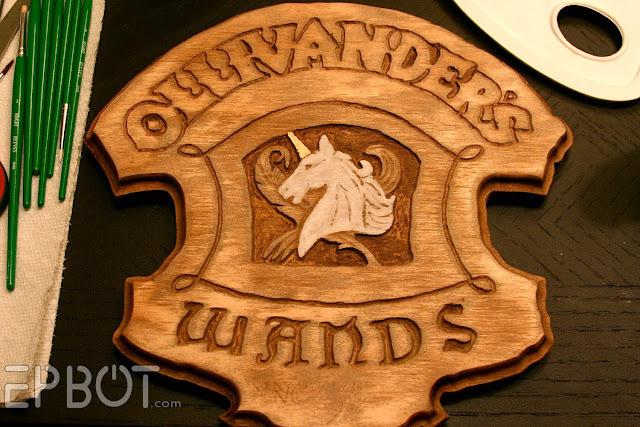 Any ideas for doing something similar to your plaque but to display the wand and box together? This is incredible! I'm always amazed by your creativity and skill. I'm trying to embroider all of the chapter illustrations from the American HP books, but so far I've only finished 1 of the nearly 200. That is a real cool project. I love my dremel to and use it for many projects. Maybe I design something like this with a giffindor emblem. I have a little tip for the really thin letters that couldn't be cut with the dremel: use an engraving tool. 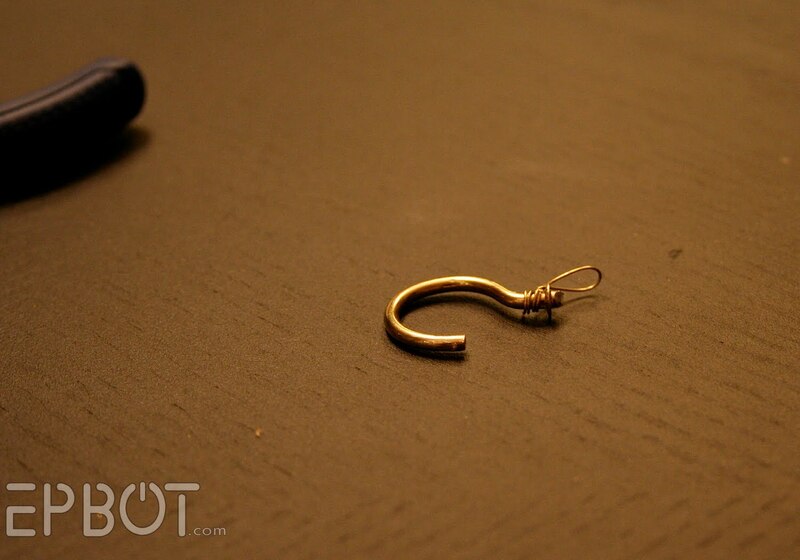 Normally they are used to engrave copper (good tool for steampunk projects), thin metal or glass. 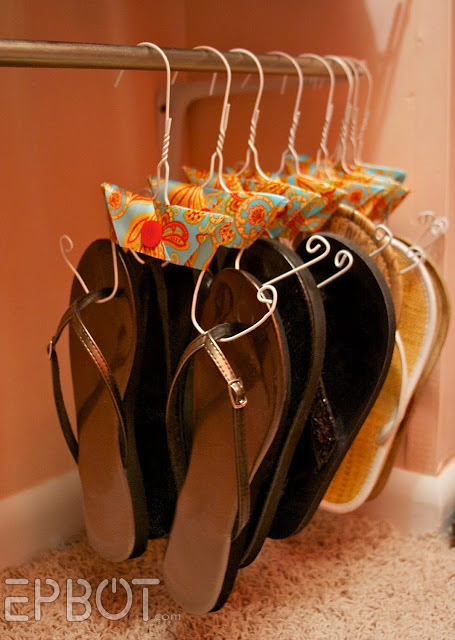 They cost about 20 dollars and are very useful. Rats, it didn't work. I guess I'll have to try making my own. Beautiful work, Jen and John. you always amaze me with the things you create together. Were you born this brilliant, or is it a kind of magic that happened when you met each other? So amazing, great work! Isn't it awesome to work with your hands!? Again, you have come up with such classy looking, cool ideas. A couple of years ago, my daughter gave me a trunk to Hogwarts. I have wand and time turner and all sorts of neat things. This is a great idea for the wand. By the way, I'm 63, love Harry Potter and Steampunk. Thanks for sharing this, Jen. Question for you: Is there a brand of the liquid gold leaf you prefer? I've had a project that I've needed gold paint of some kind for the repair of an old golden painting frame, but I've been putting it off for worry that I won't get a good gold product. Any suggestions would be awesome. Holy wow that looks amazing! What a brilliant way to show it off! I made wands for myself and a couple of friends. I used Sculpey and wooden dowels. One is loosely based on Hermione's wand. 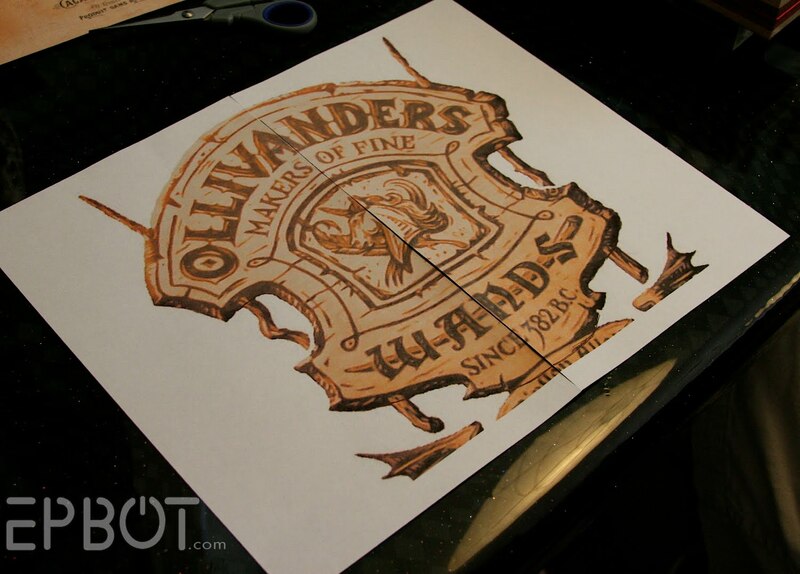 The other three designs reflect their owner's interests, since "the wand chooses the wizard." Sorry, I hit "publish" first and read the instructions for posting a link second. Hopefully this link to my Harry Potter wands will work. That looks AMAZING! 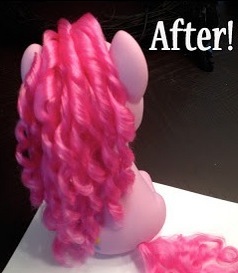 Thanks for sharing, and I love the step-by-step walkthrough with pictures. 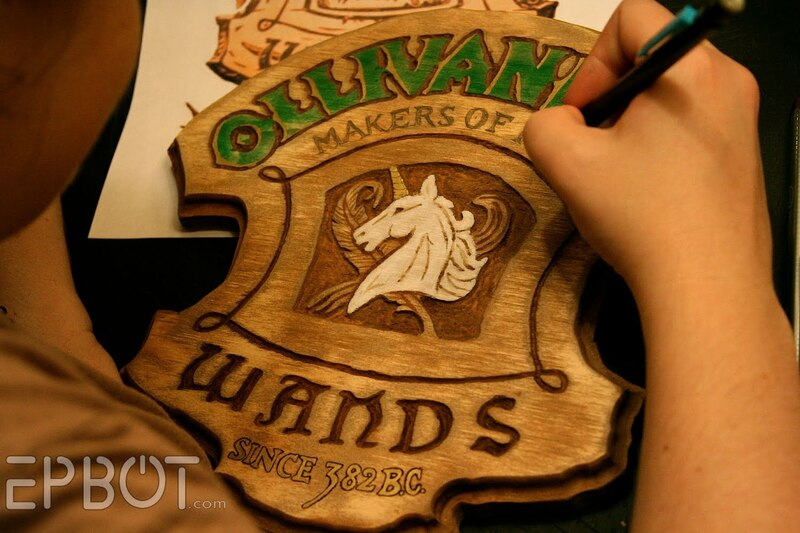 I also thought Harry Potter wands were strange and tacky, but man that looks freaking amazing! I wish I was crafty, but sadly, I'm not. But my bff and I did make butterbeer together after the last movie came out. It was delicious, but sickeningly sweet! This is amazing! You inspire me to completely geek out my new apartment! And... I know it's a really minor detail and all, and it's already done. But I still don't get it--why did you add the apostrophe? 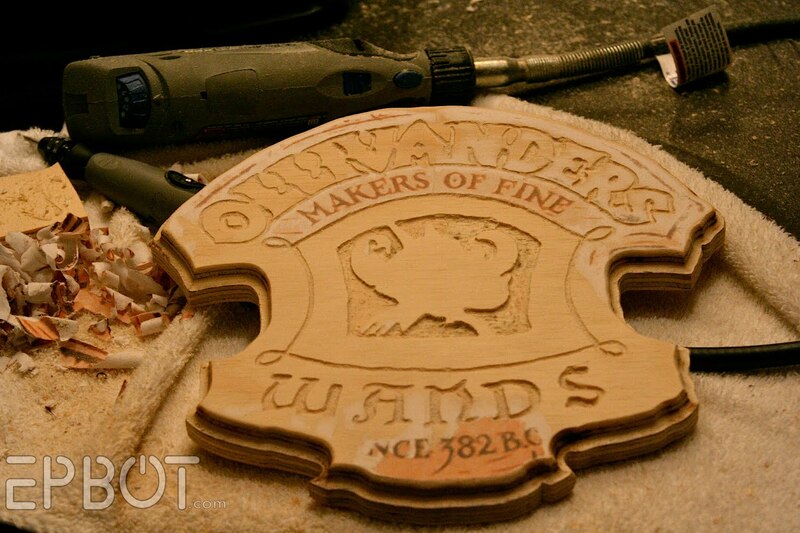 In the books, and on the template you used, it quite clearly says "Ollivanders: Makers of Fine Wands since 382 B.C." I love this! you guys are so creative! welp. that is actually incredible. Please please please start making and selling these! I know I'd buy one without thinking twice! Wow! This is the Coolest. Thing. Ever. 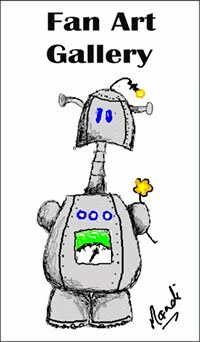 I mean, E.V.E.R., as in EH-VUH-VHERR!!!!!!!!! 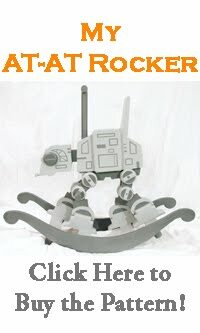 I SO want to go out and make one of these! Only, I'm not that talented, creative, crafty, attention-span-y. So, you know, I might actually gather all the materials, sit there for a few seconds looking at them, then say "Ok, I think that's about all I can do." Nice job! And on plywood, no less. 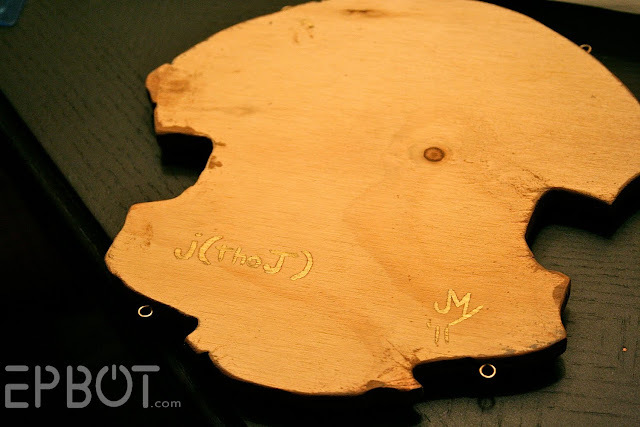 Next time, try a blank of balsa wood, it's much nicer to carve. My husband bought me a scrollsaw for Christmas one year, too. I don't use it as often as I'd like. 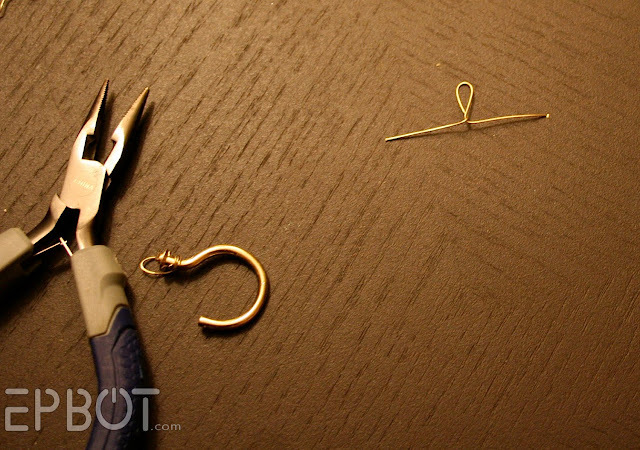 There just aren't enough hours in the day for all the crafty stuff. Um, so how much will it be for you to make me one? Or multiple ones for gifts? And yes, I"m serious. That is the coolest thing EVER. Oh wow, that is WAY cool! What a creative way to display the wand, I love it. Looks like you (both) did an excellent job on it! Wow! Nicely done, and even more nicely chronicled! 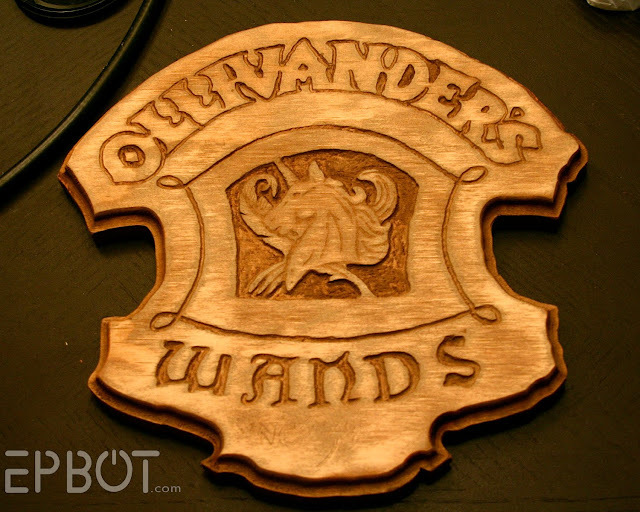 I'm currently working on a free-form design for 4 wands, and hadn't thought of anything like this. 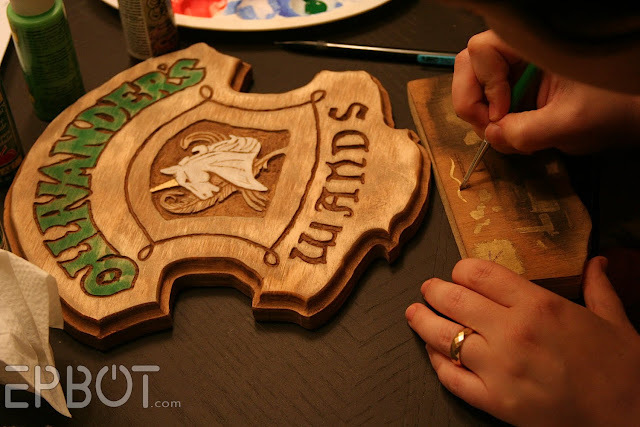 One project you may be interested in: my bro-in-law and I made a Weasley clock for my mom a few Christmases ago since she's as much of a Potter fan(atic) as me and my daughters, and it came out great. He's the crafty one, so I did all the art work and basic design, and he did the cutting and assembly. We used antique scissor halves (that move, but not of their own accord...) that we found in shops ranging from Seattle and its surrounds to Atlanta and its burbs - by far the biggest expense. Turned out great, tho. Let me know if you're interested in seeing any pictures and/or any details of how we did it. Michael, I'd love to see pics! Are they online anywhere? Freakin ridiculous... you have no idea how jealous I am. This is the most amazing thing I've ever seen!!! I'm so glad to have stumbled upon you blog! Brilliant project! Harry Potter would be proud! 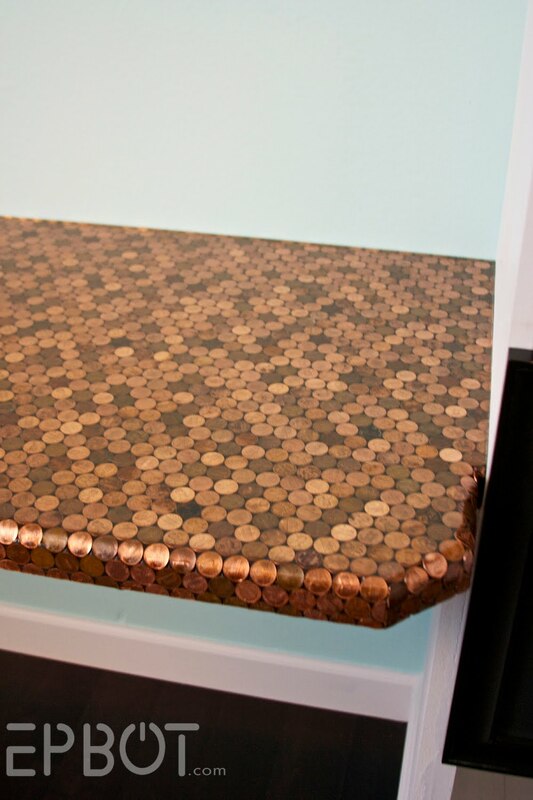 Thanks so much for sharing this -- it is lovely, and I think I may do a similar project for my son's bedroom. Your description and photos are wonderful -- thanks again so much! Awesome! This was a great foundation for my sign. I'm about 80% done but it's looking great. Will have to send you a pic when it's done. 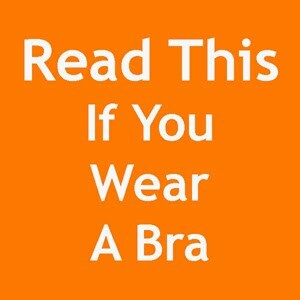 This is my sign. Still need to add the stain but even bare it looks great. Fantastic! I LOVE IT! You are so awesomely creative! I just got Fleurs wand and I am so excited to make this for it. Thank you for being so awesome!